The hospitals in, the past centuries, were instituted and conducted by the church, the Councils, but also, for the Christian charity and help freely offered, by private benefactors, by confraternities and associations. The aim was to gather the sick people, without family or abandoned by everybody, to cure them and offer what was the available: (a roof over their heads, a straw bed and some nourishment). The “Royal government” did not have any administrative interference and the pious confraternities were submitted to their Chapters and Instru­ctions or to the ecclesiastic or lay power. Even in Bronte, town with a deep-rooted religious tradition, with a clergy always numerous, of elevated level of formation and always on the side of the population, there was an ancient hospital, whose origin is confused with the origin of the town itself in his actual position (1535-1598). A first document that tells us of the existence of an charitable institution in favor of the poor and the sick is the testament of the priest Luigi Mancani, dated 1632, with which he was leaving a sum to be used for repairing an old public hospital of the invalids (the “Nosocomio”), then located where now there is the Cultural club "Enrico Cimbali" (la flight of step leading to the club is still called via Ospedale vecchio). “From that is argued that the hospital already existed, and that, probably, had been built towards the end of the XII° century" (Benedetto Radice). A successive testamentary document, dated 1679, is that of don Lorenzo Castiglione Pace, baron of Pietra Bianca, jurist and parliamen­tarian, glory and pride of Bronte, and great first benefactor of the hospital. Six days before his death (27 October 1679), with testamentary dispositions, he left all his wealth to the four daughters, with the obligation that part of the income, derived by this inheritance, would be destined to the completion and upkeep of the hospital and “ if his hereditary line would be, for some reason, discontinued, all the inheritance should be devolved" to the same purpose. 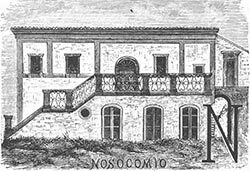 The ancient hospital of Bron­te ("Nosocomio") taken from a print of 1883. 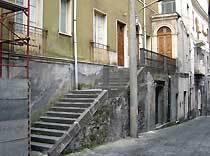 Now disap­peared, was in the actual via Ospe­dale Vecchio (the present palace of the "Cultural Club E. Cim­bali"). «Yesterday, for reasons of public utility, the widening and rectifi­ca­tion of the public road, was demolished the big. high and distingui­shed belfry of the Hospital Chapel. Inside it there was the very large entry door, wide stairs and the Chapel itself. In the high lodge of the belfry two bells, one big, and the other medium, property of the Compagnia dei Bian­chi.» (Gesualdo De Luca, 1882). Universal heir was the Assumption Chapel, seat of the Compagnia dei Bianchi, on condition that the income from the properties of the baron Castiglione would be destined to preserve and improve the poor people Hospital. La Chapel, today disappeared, was in the Rosary church, once called Abstinence church. The Compagnia dei Bianchi, founded at Bronte in 1652 with the title of Confraternity of Maria SS. del Rosario, to which could only belong “gentlemen of proved honesty”, besides to conduct and admini­strate the hospital had the aim to assist, comfort and prepare to the end the poor, the afflicted or the condemned. To the care of administrators and rectors of the Company, was built a new hospital in the same place of the preceding one, with an adjacent Chapel which became the new Congregation of the Bianchi residence. “…The hospital church and the hospital itself. because of their foundation are effective property of the compagnia dei Bianchi, who started it and, made, in part, with its money and completed them with the income of its Chapel Castiglione (the legacy of the Baron Castiglione-Pace): so the compagnia dei Bianchi is the effective founder of both works”. (Gesualdo De Luca, "Legal memory the joint ownership and the possession of the Compagnia dei Bianchi on the public church of Bronte' hospital", Catania, Tipografia Galatola, 1882). The Hospital of the poor that functioned all 1800, however, was small and inadequate to the needs of a growing population. 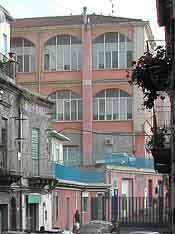 Besides, in 1882, because of the widening of Corso Umberto, part of the building was knocked down while the patients were recovered in the Capuchin convent. Bronte then had 20.000 inhabitants, tuberculosis and other contagious diseases (see cholera epide­mics) were decimating the people: “the poor ones were dying in their own hovels, with no assistance or comfort, and often were dying of starvation and desperation: the infections used to spread with a dreadful crescendo, because nobody took care of hygiene in the houses and in the streets, for poverty, ignorance, insipience, or for guilty carelessness”. The class of more indigent citizen was “compelled to implore for being recovered in hospitals of the provincial towns, as a grace more than a right”. 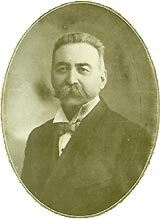 The idea to realize a new hospital came to the priest Giuseppe Prestianni (1849-1924), well deserving rector of the Real Capizzi College from 1892 to 1916, who, with his own money bought some houses and a quantity of lava ground, in the provincial road, that was outside the town boundary fence, below the railway station of the Circumetnea, between the actual M. Pagano street and Corso Umberto. The site' choice was not a particularly good one: in elevated position but in a cramped space close to a lava wall (was written then “to repair it from the north winds”) and surrounded by houses. “However, writes Benedetto Radice, to the priest Prestianni, business man and stubborn, was lacking the sense of esthetic beauty. … the Hospital could have been built in Salice district, or better at the Conventazzo district, as had been ordered in 1574 by monsignor Ludovico Torres in his pastoral visit”. The Prestianni spent "of his own money" over 70.000 lire; obtained another 20.000 lire from the Council (voted the 28.1.1901); and other 20.000 lire were recovered from the sale of the old hospital and other areas that belonged to the Capuchin convent; other sums were contributed by well deserving benefactors and public subscriptions. 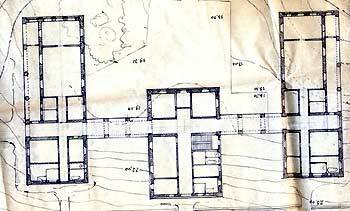 To realize such work wasn't certainly easy, the means necessary to the construction were consistent but Giuseppe Prestianni was “cocciuto” (stubborn) like Ignazio Capizzi and the new hospital was tenaciously wanted by everybody. The brontese people who contributed to the con­struction were very many: with the subscriptions were gathered about 48.000 lire, also the emi­grants sent their offers (a big contribution of 6.272,35 lire were given by an Association of brontese emigrants from the far away America, the Society "M. S. N. Spedalieri"), the Bron­te's workers gave to the new hospital one day' wages. The Cassa Agraria di Mutuo, (Mutual Agricultural Bank, the actual Popular Bank), devolved for some years its profits to the completion of the central building (balances 1921, 1922 and 1923 for a total of 28.000 Lire), and there were also testamentary legacies in favor of the new hospital (of doctor Filippo Isola, of lieutenant Nunzio Aidala, of Pietro Spedalieri and others). Lorenzo Castiglione Pace, baron of Pietra Bianca and of San Luigi in a painting by Agostino Attinà in 1864. The pre­cious painting, that be­lon­ged to the Hospital ("is pre­ser­ved in the hospital", wrote the Ra­dice in 1926), is now di­sap­peared: nobody knows how and to what title, is now in the hands of a private gentle­man. 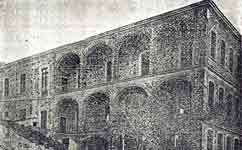 The project for the con­struction of the new hospital was drafted by the Architect Leandro Caselli (the same that projected in 1892 the new wing of the Capizzi Col­lege) and com­prised three multi­sto­ried structures, one in the center and two on the sides, communicating with the first "through covered arcades". 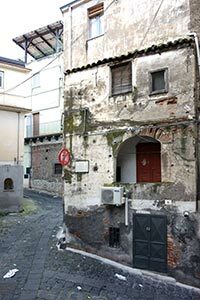 Initially could hospitalize 60 patients beside the medical staff, the well deserving sisters, the attendants, kitchens, stores, and lodging of the custodian (in the same period the four big hospitals of Catania could provide 800 beds). The project should have provided also an ample entry on the principal prospect of the edifice (63,30 meters long); should have been built on via Pagano, "which should have been properly put in order, in a way that after the expropriation and demolition of the adjacent houses, the road bed would have been considerably enlarged and lowered"; however, principally for the excessive cost, (over 10.000 lire), the ample entry, designed by the architect Caselli was never totally realized. The work was interrupted during the war (1915-1918), began again in 1921 and the first pavilion was inaugurated the 3 February 1923. Few years later was completed the western pavilion that comprised in the ground floor the kitchen, the ovens, the pantries, the stores, the laundry, the disinfection's room and, on the first and second floor, "the common infirmaries and those in separate rooms, that is with male and female wards" (altogether 29 beds). After the death of father Prestianni (1924) another priest, Benedetto Ciraldo and the local Charity Congregation (the ex Compagnia dei Bianchi), continued the completion of the work. Continued also the unceasing , generous contribute and the offers of the brontese people for the acquisition of the furniture, the linen, the surgical instruments and the pharmaceutical material. 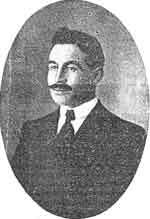 A famous benefactor of the hospital was the young lieutenant Nunzio Aidala, son of the notary Giusep­pe. Born in Bronte the 26.2.1889, wounded on the S. Marco the 15.11.1916 died the day after at Gorizia. Before facing the dangers of the war and maybe fore­boding his destiny, made a testament leaving all his re­levant riches to the Hospi­tal of the poor people. 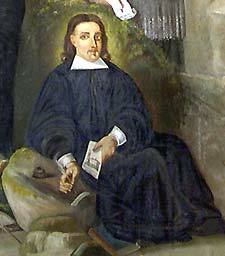 The doctor Filippo Isola, one of the major bene­factors that gave part of his wealth in favor of the poor's hospital. He was born in Bronte the 15th of June 1860, and at 26 years of age, graduated with honors in medicine, took part in the help squad, created by Benedetto Radice, in the cholera of 1887. 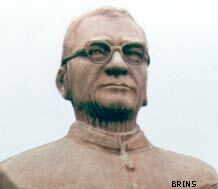 Died on 27.1.1919, back from New York, where had exercised his medical profession. Was also a writer and poet having published several books. 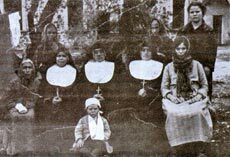 In March 1925 the Charity Congregation had a debt of 19.010,70 lire, "to be extinguished with the offer promised by the Cassa Agraria di Mutuo (Mutual Agrarian Bank) over the 1924 balance and with the generous donations of other boards and benefactors". Lastly was built the eastern pavilion, composed by ground floor and first floor for a total of 29 beds. The historian Benedetto Radice printed in 1926 his “Historic Memories of Bronte” “in favor of the Civic Hospital” to which devolved also the literary property. Concluding the pious work that conducted "Hospital of the poor” following a unanimous vote of the Council was deliberated to entitle the new con­struction “Ospedale Castiglione Prestianni” with the names of the two prin­cipal founders and benefactors. Two old photos of the construction of the Hospital (1925). For economic reasons, the original project of the Caselli, was somehow reduced: were eliminated a second and third floors, foreseen on the central pavilion, whose first floor was adequately elevated in relation to the height of the lateral pavilions, the ample entry with flight of steps from Via Pagano was not realized. 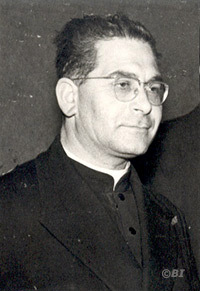 Yet another brontese priest, Antonino Rubino, elected in 1952 President of the "Castiglione Prestianni", continued for a quarter of century the work of Giuseppe Prestianni and of Benedetto Ciraldo, strengthening the organization and the internal structures of the Hospital and modernizing the ancient infirmary with the creation of divisions of medicine, surgery, obstetrics, gynecology, pediatrics, and laboratories of analysis and radiology. After his death (1975), the Hospital was inserted by the Sanitary Reform inside the Local Sanitary Unit n° 39. A square of Corso Umberto was dedicated to Father Rubino (the one in front of the Circle of Culture, once the site of the ancient Nosocomio, the public hospital of the sick). Nothing to complain if not the wrong done to others, the lack of recognition and the little memory of the Bronte area: the first square was called "Piazza Castiglione". 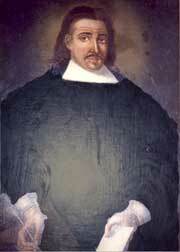 It had already been rightly named by our ancestors to the founder of the Hospital: the baron Castiglione Pace. 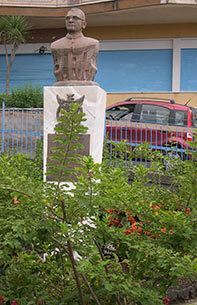 The monument erected in 1986 by the U.S.L. 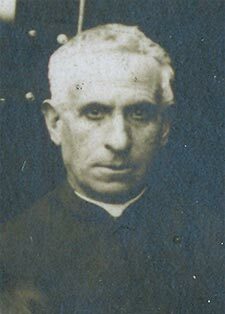 39 to father Rubino, who was also parish priest for the Rosary church (seat of the ancient Assumption chapel and of the Compagnia dei Bianchi). The plaque says: "Sicilian Region - U.S.L. 39 - Don Antonino Rubino, President of the Castiglione Prestianni from 1952 to 1975 - Bronte 25-4-1986".